I spent a year living in rural Pennsylvania, and while I was there I had a huge garden and a small orchard. I froze fruit, made applesauce, harvested garlic, learned to make pesto from different greens to deal with the chard that ran wild in my garden, picked berries, foraged for chives in the spring…I was just learning, so I didn’t do anything stupid like pick mushrooms, but one of my favorite parts of living in the country was how much the land gave you if you looked. Even an idiot like me could materially reduce their grocery bill just by paying attention. Then I moved to Boston, where opportunities for gleaning were much thinner on the ground, and I was too busy to take advantage anyway. Apart from a memorable trip to pick blackberries, my time in the big city flew by in a blur of grad school and Trader Joe’s frozen meals. I must have managed to strike the appropriate air of adult authority, because I gave her my best Disapproving Look and said “I would really prefer if you asked your mum first.” And she said “aw man!” but let the berry fall, and I moved on. At this point I was lugging around a giant pot literally overflowing with berries, so I slogged home and started de-stemming them. Five hours and no breaks later, I had about three pints of elderberry syrup, a purple-stained countertop, and four or five cups of elderberries for muffins (check! ), freezing (check!) and leaving in the fridge too long and letting them get mouldy, thereby wasting all my hard work (check!). I’m including two pictures, including one blurry one with my face in it – for context. 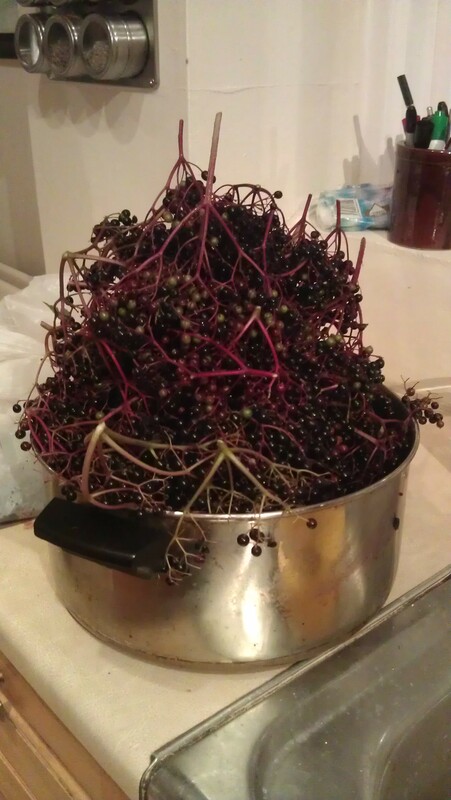 We are talking serious elderberry action. The pot was so big that I had trouble getting everything into the photo. Epic is right! 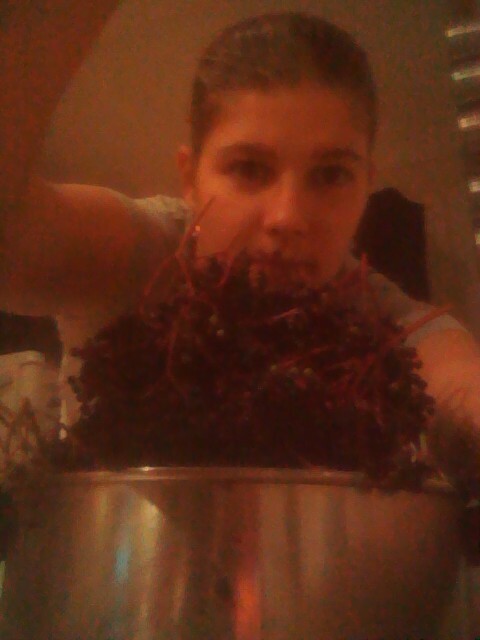 Holy crow that’s a lot of berries!